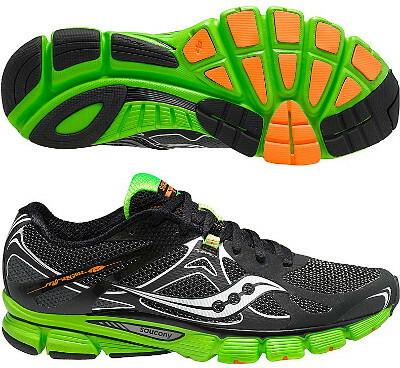 Saucony Mirage 4 are stability performance running shoes. The Saucony Mirage 4 is a versatile running shoe which provides support for low/mid overpronation with just 4 mm offset for a more natural footstrike. Unfortunately not as famous as its relative for neutral runners the popular Kinvara 4. Few changes compared to its predecessor Mirage 3. New upper design not only looks more modern but also more ergonomic and breathable with improved FlexFilm on breathable mesh for longer durability. Midfoot straps provide custom fit through lacing system. Other marked change in the Mirage 4 is the replacement of ProGrid foam with more efficient PowerGrid in midsole for enhanced responsive cushioning. Medial post provides correction for low/mid overpronation. No changes in outsole with harder rubber (XT-900) in more exposed areas for longer durability.